[P]ortland, Maine quartet Tricky Britches have a brand new album out titled Good Company and for all you folks that like to get up and dance around to your music I highly suggest you check it out. 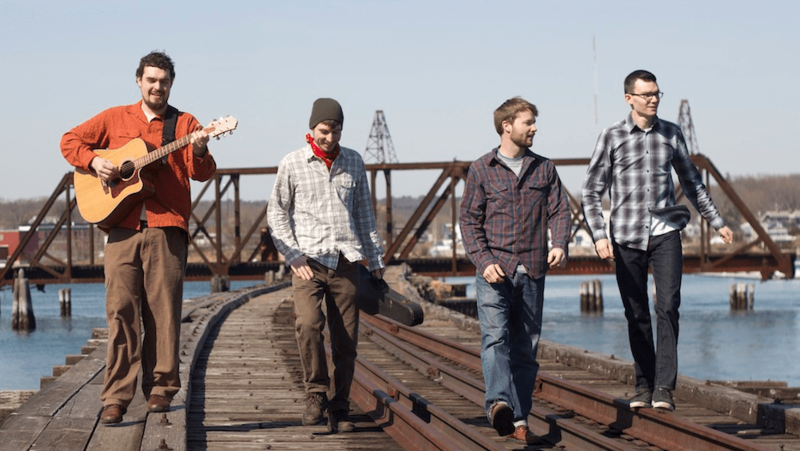 The latest release follows the band’s first EP, Hop On a Train, and debut album, Hard Fought Day, which made them the bluegrass champs of New England. Tricky Britches came together as a harmonizing three-piece in 2009 with Seth Doyle on mandolin/guitar, Tyler Lienhardt on fiddle, and Jed Bresett on bass. They played every street corner they could find from Maine to Massachusetts, quickly becoming the go-to-band for every party and wedding thrown throughout the area. The guys noticed there was a musical element missing and in 2011 filled that banjo void with the picking prowess of Ryan Wilkinson. Good Company is music that just flat-out makes you feel good. There is something to be said for a fast played fiddle and slap-thumping, stand-up bass that clears away one’s troubles and in the opening track ,”Leave My Troubles Behind,” you get all that and then some. It’s a do-si-do of a song and sets the good time mood found throughout the album. Now that’s not to say that there aren’t a few life-pondering, soul searching songs thrown in the mix but even the jail bound woe of “Black & White Stripes,” and the hell bound hijinks of “Creepin’ Up On Me,” can’t keep you from shaking those hips. The instrumental tracks “Monadnock,” and the album’s closer “Sally Ann/Rye Straw,” are hoedown highlights that showcase some mighty fine fiddle and harmonica talent. This is the kind of album you’ll want to play again and again to keep the spirits high. Put in on at a party in need of a good kick in the dance-pants and see how quickly your guests start swinging their partners around the room. Just be sure the punch bowl is safe and secure. Now for all our local friends, you will get a chance to kick up your heels this Wednesday (May 22nd) at Club Passim in Cambridge for the Good Company record release party. If you’re like me and need a little re-energizing come midweek then this show is for you. Show of your fancy footwork (and finest pearl-snap cowboy shirt) while showing the Portland boys that Boston music fans can keep a boot tapping beat with the best of ’em. The show gets going at 8pm and tickets/information can be found on the Club Passim website. Take a listen to the fantastic opening song “Leave My Troubles Behind” above and follow Tricky Britches on Facebook, Twitter and on their band website. Tricky Britches liked this on Facebook. I agree with you. I love their collection. really good.